When you feel separate from your divine essence, there is a spiral of energy that you can tap into to reconnect. It is called the love spiral. 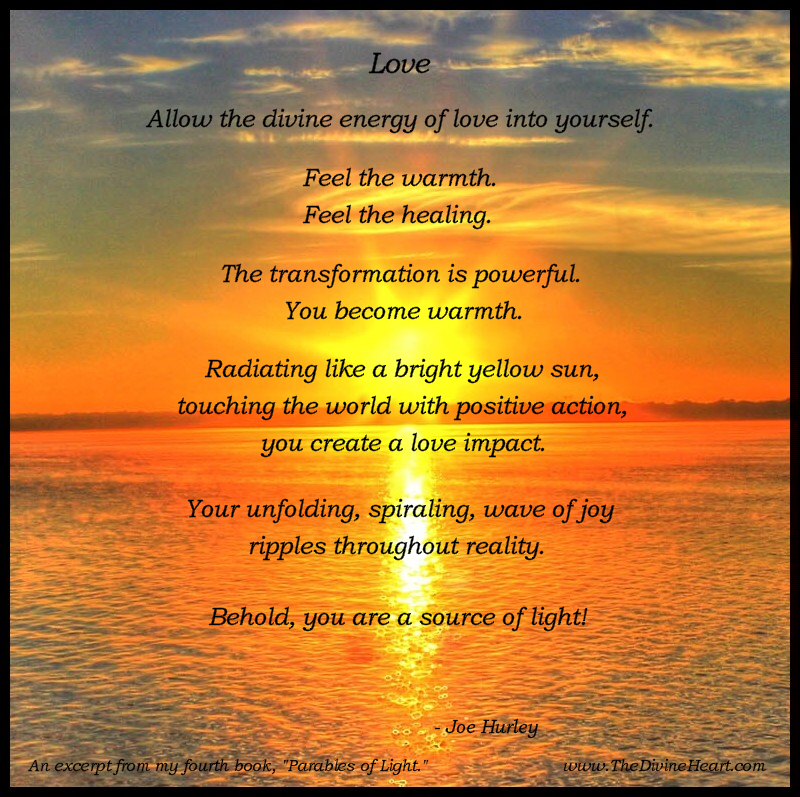 The love spiral comes from deep within the heart and expands outward into the divine. The love spiral takes you back. It takes you back home. It takes you back to you. Attune to love and you are home. You are your concrete physical reality, your stirring emotional vibrations, your wonderful systems of thought, and your amazing divine flow. All these aspects make you whole. As you experience these aspects of yourself, you begin to recognize consciously that you are whole. To integrate the wisdom of your wholeness, simply experience all aspects of your multidimensional life: physical, emotional, mental, and spiritual. If you have any conceptual boxes, limits, judgments, or rules that prevent you from experiencing any aspect of your whole self, simply own these and let them go. Awakening to wholeness is a simple process. It is also a big step for your human consciousness. To truly own your body as a conscious being, to truly embrace the wisdom of your emotions, to truly acknowledge the power of your thoughts, and to truly own that you are a divine being of light - these are all amazing steps for your human awareness. Welcome each step that you take into expanded awareness and enlightened consciousness. Welcome each step that you take into a deeper understanding, acceptance, and appreciation of the whole you. I invite you to access your true divine heart. Take a moment and unplug from any energetic impulses that may be taking you deeper into darkness, pain and suffering. Take a moment and set your intent to be free from any energy entanglements, attachments, and old ways that are causing discomfort. Take a moment and access the intent that is within you to awaken. Open your heart to your reality that is beyond. Open your heart to a place that is your divine. In this place, connect with your divine knowing, your divine sensing, and your divine essence. Open and truly sense, feel, and flow from within your divine heart pulse. When your mind is overwhelmed and/or confused, you can always go into this pulse of your divine heart. When your heart is filled with sadness, sorrow, heaviness, or heartache, you can always go into this pulse of your divine heart. Your divine heart pulse is your center. Your divine heart pulse is your nexus, connecting your human self with your divine essence. Center from within your divine heart and you become your divine essence in human form. Center within your divine heart and pulse. Connect deeper within your divine heart pulse and attune to your divine plan. You are here experiencing second, third, and fourth dimensional reality for a reason. From deep within your divine intent you have a path. Open your eyes to the world around you and take a new expanded look. Things are not what they have seemed. Sense and know your truth, your divine truth. Sense and know your heart wisdom, your divine heart wisdom. Sense and know your love, your pure divine heart love. Remember you are in but also beyond this second, third, and fourth dimensional matrix. You are a part of the divine. Open to your divine heart and know who you really are. Open to, see, and acknowledge the outside from within the divine place that is your inside. You are a beautiful light. The following is a rough outline of a few things to keep in mind when looking within a person’s energy fields to do a healing consultation. Karma is often defined as the sum of your actions in this and previous states of existence, viewed as deciding your fate in future existences. With each action you experience and learn. You develop patterns. You begin to operate out of these patterns. You now have old patterns from the past that are stored in your energy fields. Your fate is decided by your patterns - until you become awakened. When awakened and consciously aware of your patterns, you now can choose to operate out of past patterns or your free will. To heal, look at your patterns and become aware of how they are impacting your life. Choose to move beyond them when they are no longer in divine alignment with you and your path. In this area, you have the genetic codes in your cells. You also have patterns of consciousness held in your cells from before you were born that are your ancestral consciousness. You operate out of genetic codes and ancestral energies until you become consciously aware of these programs and dynamics. When you differentiate your present self and divine essence from these ways, you can consciously respect these ways and continue to follow them or choose a new way to go forward if a new way is more honoring and respectful to your authentic self and present situation. To heal, attune to any genetic or ancestral information that is no longer in divine alignment with you and your path and then differentiate from this information and go forward as your true authentic self now. In this area, you have current emotional sensations and awareness from present time. You also have the emotional consciousness from past memories, associations, reaction patterns, and other learned responses from all your life experiences. To heal, learn how to emotionally differentiate. Differentiate your feelings now from those around you. Differentiate your feelings now from dynamics stored in your energy fields from the past. Go forward as your clear, authentic, emotional self now. In this area, you have conscious thoughts and mental interpretations of reality. These thoughts create your conceptual reality and shape your emotional experiences. To heal, become aware of how your thoughts are shaping and creating your reality. Learn to differentiate your true divine essence from your conceptual ideas and creations. Learn to let go of and expand beyond any tribal, group, or social way of thought that prevents you from honoring you or any other individual authentic self. In this area, you have old thoughts, beliefs, conceptual paradigms, patterns, and programs that you have developed over time and have stored in your subconscious. This is your set of filters by which you see and interpret reality - without consciously thinking about it. These filters are the source of your physical, emotional, and mental hooks, triggers, and reactions. To heal, identify when you are hooked, triggered, and caught up in a reaction. Identify the subconscious belief, judgment, or expectation that is uncomfortable. The key here is to allow old judgments and belief programs to come up so that you can know what your subconscious patterns are expecting from reality. If you are reacting, then most likely your present reality does not fit their expected way. Become conscious of your subconscious expectations. Differentiate yourself from your judgments and outdated beliefs. Go forward as your authentic wisdom, love, and light. In this area, you have your fight-or-flight response, primitive thought foundations, primal memories, control patterns, and issues of will. These energies care about survival, winning, being in power, and staying in control. To heal, become aware of any desire to fight or to hide. Become aware of any feelings of helplessness or powerlessness. Become aware of any feelings of fear or terror. Become aware of any thoughts or beliefs about not being safe. The key here is to be aware of what energies trigger you into reaction or dis-ease relating to your sense of feeling out of control or unsafe. Learn to differentiate your primal survival and control issues from your wisdom, love, and light. Learn to go forward as your wisdom, love, and light. The Chakras are subtle energy centers or light engines within and around the body that create and hold many unique patterns of consciousness. Each energy center/engine has a specific meaning and purpose. The information is unique and it transcends the different dimensional levels. To heal, learn to sense, feel, and know the flow of each Chakra. Identify blocks, own the emotion and beliefs associated with those blocks, and open to your wisdom, love, and light with regard your emotion and beliefs. The key here is to learn to sense and become aware of your subtle energy centers and to assist your divine flow through these centers when there is discomfort and/or blocks to your flow. Each person is a complex energy system relating to other complex energy systems in multidimensional ways. Awareness and understanding of your complex energetic relationships will help you to discover the deeper dynamics creating your symptoms and/or uncomfortable situations. To heal, open to the larger multidimensional matrix. Scan specific relationship dynamics to see how one energy is relating to other energies and how those relationships are creating and impacting the different patterns of consciousness on all levels. Look at friends, family, intimate partners, co-workers, pets, other nonhuman life forms, energy from the media, group energies, race consciousness energies, and other energies from global, galactic, and other dimensions. The key here is to become aware of how your energies are interacting with the energies of those you are in relationship with and with those all around you. Learn to differentiate physically, emotionally, mentally, and spiritually. Learn to be your true authentic self on all levels. As an energetic being, you have many layers of physical, emotional, mental, and spiritual energy pulsing multidimensionally. Sometimes you get out of balance energetically. To heal, look at, sense, and feel your poles, polarity, electromagnetic fields, and grounding cords. These are areas of energy that are constantly rebalancing and realigning, as the shifts in consciousness occur. The key here is to use your intention and higher divine focus to bring about balance, stability, and optimal health within your multidimensional energy dynamics. Beyond your body, emotions, and mind, is the spirit realm. This realm is actually many layers of multidimensional consciousness. Many times there are gifts located in the higher dimensions that are waiting to be brought into physical awareness and/or ready to be placed into the area of consciousness being worked with. Many times your angels, guides, and other spiritual beings have gifts to offer relating to each issue you are dealing with. Many times you can receive sacred messages, activation of key points, divine symbols that transmit special energy, and more. To heal, open to your divine wisdom, love, and light and ask your angels and guides to show you the specific tools you need to reach the next level of healing that is in your highest and best interest. We all experience discomfort at one point or another in our lives. And many people have been experiencing some intense discomfort lately. In this article, I focus on the subject of healing discomfort. As an energy sensitive person, I sense disharmony in very acute ways. I sense disharmony both internally within myself and externally within the dynamics around me. Earlier in life, I became lost in the discomfort I sensed. I became so lost that I adopted an identity of being a victim. Thank goodness those days are gone. Today, I have expanded my consciousness and my identity beyond the role of victim and beyond any role that I choose to play. Today, from an expanded place of consciousness, I have much more freedom and choice with regard to the energy dynamics that I choose to work with, play with, and create. Today, when I sense disharmony and discomfort, I take the time to really face it, sense it, listen to it and learn from it. And then, I shift. Instead of getting stuck in it, I open up to my higher self and I ask for divine wisdom. Sometimes, I get clear information immediately to help me. Other times I get nothing, but hours later when I am not thinking about it, the wisdom and support that I need to resolve the disharmony comes in to heal the discomfort. In every case, when I ask for divine wisdom and help, I always receive the help that I need. There are many gifts that come from the higher frequencies of divine awareness. My favorites are the energies of courage, grace, wisdom, and love. These are the tools of lighter consciousness that always come when I ask for help. These are the energies of light that are available to all of us when we choose to open and heal. We are each beings of light consciousness. When we accept the lighter and higher vibrational parts of self, we heal, and we begin to create the loving joyful life that we truly desire. If you are experiencing discomfort right now, turn and look at it directly. Listen to it. Sense it. Feel it. Hear what it saying and know it completely. Discomfort is communicating to you. Open to this communication. You may not like the dynamic now, but open to the wisdom of the communication and respect the source of your discomfort. Discomfort exists for a reason. As you understand this, you gain the key to healing your discomfort. If you get confused by your discomfort or lost in your reaction to your discomfort, then remember to open to the wisdom and love of your higher consciousness. And remember to let go of control. Let the clarity and support come in ways never before imagined. There is an unlimited supply of courage, grace, wisdom, and unconditional love flowing through your fields to help and support you. These energies are free and available to you, right now. These energies are you. With courage, you can face anything. With divine wisdom, you can become clear in any situation. With grace you can let go and accept unconditional love within any dynamic. Simply take a moment and ask your divine energies to guide you, inspire you, and heal you. Give permission, open, and receive. The human heart is amazing in its ability to experience love, wisdom, compassion, and caring. The human heart is amazing in its ability to experience sadness, disappointment, and sorrow. Living life with a full and open heart means opening to it all and accepting the passion, mystery and flow of life. Living with a full and open heart also means accepting each powerful impact when the flow of life hits hard. What happens when the passion of life brings sadness, sorrow, and disappointment beyond the human ability to tolerate? Patterns of reaction, defensive protection, and other survival instincts take over and there is separation from the heavy and broken heart. Unfortunately, there is also separation from the deep love, joy, and caring for life. And so life has been. But times are changing. New energies have been entering the physical plane in amazing ways. These energies continue to bring a higher vibrational divine flow into all energy systems. Each human heart now has the opportunity to open to this divine flow. Each human heart now has the opportunity to experience this higher vibrational pulse. Each human heart now has the opportunity to experience a unique connection to this amazing source of wisdom, love, and light. The divine heart's higher frequency is beyond the mental field of dualistic thought. The divine heart's frequency is beyond the vibration of good or bad, right or wrong, fair or unfair, just or unjust. The divine heart is simply pure divine energy. The divine heart is simply pure divine love, pure divine wisdom, pure divine joy, pure divine grace, pure divine peace, and pure divine essence. Has life hit you hard? Have you shut off and gone into a way of life that protects and deflects the love, wisdom, and joy of your heart so you can survive? You can open your heart and experience wisdom, love, and light within you now. You can open up and experience the real authentic you now. Hear it, sense it, feel it. Allow the Holy Spirit to fill you. Ask divine grace to support you. Embrace pure divine wisdom as it guides you. Become one with the divine love that is you. The fight and struggle are over. Open to your divine heart. You are now a divine presence in everyday life. You are now a divine presence within the context of all that is. You are now a divine presence in the center of all that is. Welcome to the real you. The healing stream is a frequency of energy that comes from the divine source. Some people call this source God, the higher self, the higher power, the divine self, the creator, the spirit, and other names. The key is that this energy exists in a higher dimensional plane of existence and it flows interdimensionally into the mind, emotion, and body fields of each and every one of us. This divine flow provides each of us with healing wisdom, love, and light. When we tap into the healing stream consciously, we gain the ability to do spiritual healing and energy healing. Anyone can do spiritual healing and energy healing simply by asking to connect with the divine energies of the healing stream. When we connect with the healing stream, we connect with the divine energies and we get energized, guided, and supported in a new way. Connecting consciously to the divine energies of the healing stream is really about focusing attention and intention. We can intend and be attentive to our physical flow, emotional flow, and mental flow. We also can intend and attune directly to our spiritual flow. When we focus our intention and our attention, we begin to notice little things about our bodies, emotions, minds, and spirits. We begin to notice what feels good. We also begin to notice what does not feel so good. The healing stream provides us with healing wisdom, love, and guidance so we can care for what hurts that needs our attention, respect, and love. Many people, when opening up to the healing stream, find a deep connection with angels and higher vibrational guides. There are angels and guides around all of us. These angels and guides are here to help us. It is important to ask for our angels and guides to help. They always help, even if they cannot stop what is happening in our lives, they always help. They comfort, guide, and support us so we get just what we need, just when we need it. Can you sense the angels around you? Do you sense other types of divine guidance around you? Opening to the healing stream awakens our awareness to the divine all around us. It also opens us to the divine within us. We are each divine beings here in human form. We each have a unique divine vibration. When we learn to attune to and access our unique vibration, then we learn about our divine note. 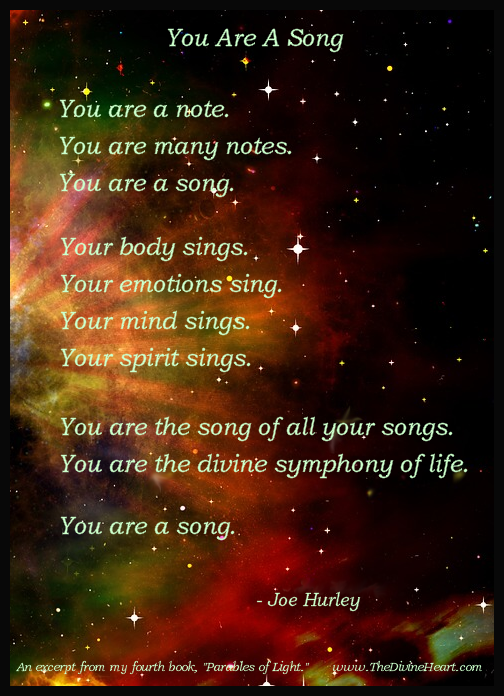 We learn to sound our divine note consciously. This accelerates our awakening and opening to our beautiful song. We can then sing our song and shine our light with joy, clarity, and confidence. As divine beings in human form, we connect with all other beings through the healing stream of divine energy flow. Our hearts are the center and nexus point of this flow. When you want to get centered and balanced, simply go into your heart center, sound your unique divine note, and dance in the healing stream of divine energies. What amazing new ways of creating we have ahead! 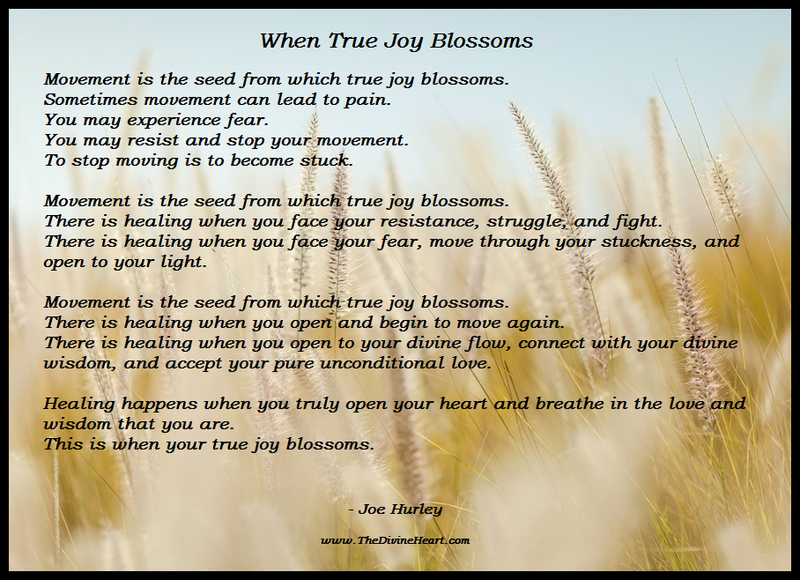 What amazing new levels of happiness, joy, peace, and love we have within to share with each other as we open to the healing stream, access our divine energies, and connect with each other through our divine heart flow. divine beings holding space for us to connect. holding space for us to flow our true divine flow. divine beings holding space for us to dance. and our love and wisdom flow. divine beings holding space for us to heal. and sparking the divine music that we have always known. divine beings holding space for us to know. We are the love and we are the light. We are the wisdom of our true divine flow. Welcome to my new blog. I will have my posts up here shortly. In the meantime, please check out my website for many new healing articles, books, e-courses, movies, guides and more.